Self-tracking is, in my opinion, the most powerful weapon I can wish for in my battle against Parkinson’s disease (PD) and I will explain why. I see my neurologist once or twice a year, about half-an-hour every time. That is one hour per year, and the rest of the year’s 8 765 hours, I spend in selfcare. This means that I am directly “exposed” to healthcare’s practises and clinical guidelines for my PD during one hour per year. And it is only during this one hour that my neurologist can assess my symptoms, observe my condition and evaluate my status. It is also during this one hour per year that my treatment is being prescribed, different medications and other interventions. But it is during the rest of the year’s 8 765 hours, that I implement the treatment. Because, let’s be honest, my neurologist doesn’t even know if I take the medications he prescribes. And, probably most important, it is during the 8 765 hours in selfcare that I can observe the effects of the treatment. And this is where self-tracking comes in. As most of my readers probably know, I have been involved in the Quantified Self (QS) community for a few years. I have spoken at all three Quantified Self Europe conferences and my talk from the first one, in 2011, is mentioned in this article from The Economist. I hope that the QS community will be able to help me understand my latest “health challenge”. I bought a pulse band last week because I have for a long time wanted to investigate my heart function, mostly out of curiosity. I have worn it on and off for a few days now and have found that my resting heart rate is very high. Sitting here writing this, my HR is in the 90s… I wore the band to a 5 km evening walk yesterday and you can see the result below. My max HR during the walk was 147 BPM and the average was 118. The lowest HR was 86 and that was during a period of rest around 55 mins in (my back was cramping a bit). I also wore the pulse band during last night’s sleep, see below. I accidentally paused the session for a few hours but I think it is probably representative enough. The sharp increase to 102 BPM just at the end is when I got out of bed. My lowest HR during last night was 66 BPM and the average was 77. The peaks at approx 01:50 hrs and 03:20 hrs are probably the result of me waking up and turning over in bed. Is it PD-related or not? – There is a connection between PD and autonomous nervous system dysfunction, so it could be. But then again, maybe it doesn’t matter if it’s PD-related? Is it connected to my thyroid hormone replacement therapy? It definitely could be, which is why I have made an appointment for checking my T3 and T4 values. Is a high RHR dangerous? I would love to hear what you think about this. 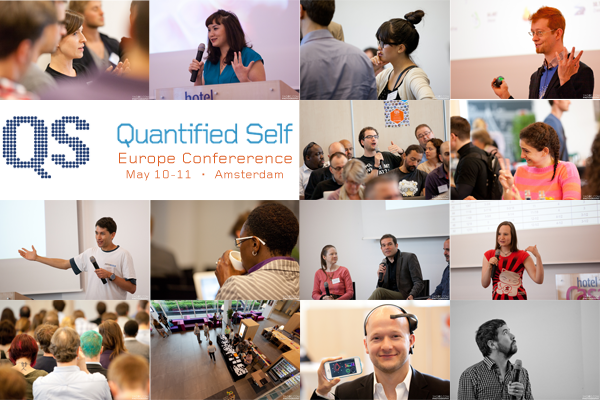 This week I am in Amsterdam for the third Quantified Self Europe conference. I am really looking forward to seeing everybody again and be part of the amazing discussions that will happen. This is an article written by Jon Palfreman for The Journal of Parkinson’s disease, published on 20th March 2014. It is published here with the permission of the author. The original article can be found at: http://www.journalofparkinsonsdisease.com/JPD/The_Patient_Perspective.html. In October 1984, a thirteen-year-old girl called Sara sat in a small village hall in northern Sweden enjoying a folk music concert. “Everyone was clapping their hands and stomping their feet,” Sara recalls, “and I wanted to do the same. I could clap my hands, but when I tried stomping my feet, I discovered I couldn’t. 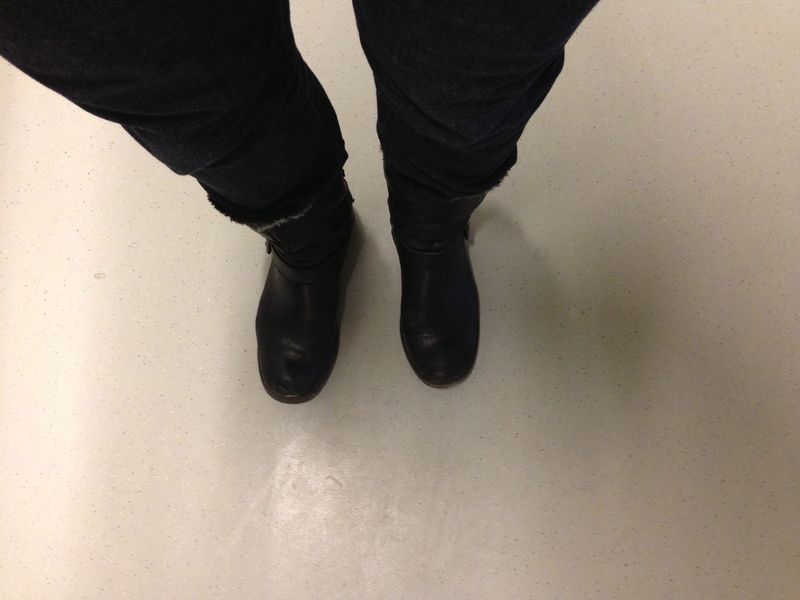 It was as if the signals couldn’t go from my brain to my feet.” This is Sara’s earliest memory indicating that something was wrong. In the years ahead, Sara’s mother, too, noticed her teenage daughter moving differently from her peers. Sara, she observed, struggled when riding a bike, buttoning a sweater, or tying shoelaces and also dragged one of her feet when she walked. The school physician sent Sara to a neurologist, who after initially dismissing her symptoms as psychosomatic settled on a diagnosis of “generalized dystonia,” a lifelong affliction where muscles contract involuntarily. Sara’s life was shattered. “I fell down into a black hole.” After thinking she had been effectively cured, Sara — now caring for a baby just a few months old — had learned she had an incurable neurodegenerative disease. Sara has her own version of the stages of grief that individuals pass through when coming to terms with an incurable illness: her five include shock (at hearing the news); sorrow, (that’s mourning the future you won’t now have); searching (for information); sharing (that’s supporting your patient community), and finally shaping (making your own future again). The first time Sara made this journey from “patient with generalized dystonia” back to “person” it took her, she says, about 16 years. Now she had to go through the transformation again for Parkinson’s disease. This time it was much quicker. For two reasons. Firstly, she’d done it before. Secondly, the world had changed. “In 2003,” she says, “there was lots of new technology not around in 1987 — there was the Internet, there was Google, there was Facebook. 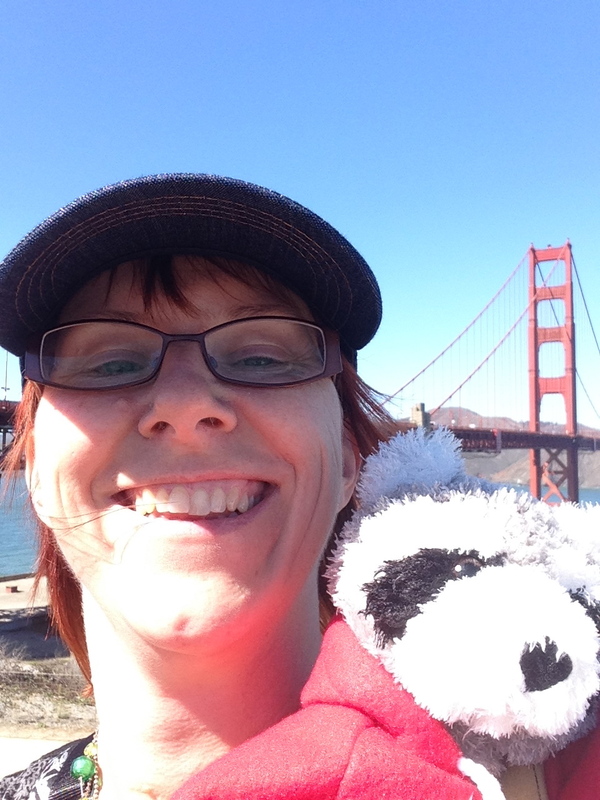 Information was everywhere and it was very easy to get yourself educated and connect yourself with other interested parties.” Sara has rebounded from the shock of her Parkinson’s diagnosis; she’s become a thought leader among parkies in a new age of social media. 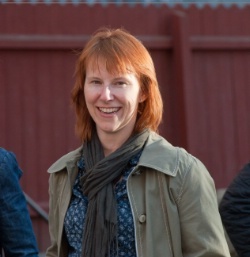 Sara Riggare not only went back to school, to Stockholm’s Karolinska Institute, to work on her masters and doctorate in health informatics, but also became an entrepreneur. Riggare passionately believes that patients need to be much more involved in their treatment; that they should take ownership of their disease. The clinical status quo, she argues, is unacceptable, especially for chronic diseases like Parkinson’s. Like most people with Parkinson’s, Sara sees her neurologist every six months for a 30-minute session, and thus spends about one hour in total per year being observed. That leaves, she says, 8,756 hours per year of self care; time when she and others with Parkinson’s experience symptoms, but when nobody’s paying attention. Sara realized that the same technologies that enabled Google and Facebook offered patients some transformative possibilities for better monitoring their health. She set out to adapt inexpensive consumer products like Fitbit and Jawbone — which use microscopic gyroscopes, accelerometers, and magnetometers to track fitness — so that people with Parkinson’s disease could better understand and control their condition. And she used herself for a pilot study. Working with a business partner, Riggare is developing a smart phone application that other Parkinson’s patients can use to learn more about the specific patterns of their disease. Of course Sara isn’t the first to think of this. There are a number of expensive proprietary systems under development including the European SENSE- PARK project, the Cleveland-based Great Lakes Neurotechnologies, APDM in Portland, Oregon, and Global Kinetics in Melbourne, Australia. These companies are working on various combinations of advanced wearable sensors (worn on sites like the wrist, waist, and ankle), which track multiple domains — bradykinesia, tremor, walking, gait, balance, cognition and more. They are hard at work fashioning algorithms to extract meaningful metrics from the data. Most of these technologies are designed to be used in the clinic, under the control of a neurologist. And the companies’ business models are based on anticipated revenues from traditional Parkinson’s care and FDA regulated clinical trials. Sara sees her goal as different. “My mission is to give individual patients the tools to improve their own healthcare experience. I need to show that my research can change things for me and for the world, and that it can make an immediate benefit, not in 10 or 20 years.” Interestingly, such ideas of a more personalized, patient-driven healthcare system find support outside of mainstream medicine. A number of powerful constituencies get very excited by the concept of wearable sensors: from Silicon Valley entrepreneurs making smart devices for the health and fitness market to proponents of the “quantified self” movement (a community where individuals seek “self knowledge through self tracking”), to scientists interested in amassing and analyzing “big data”. 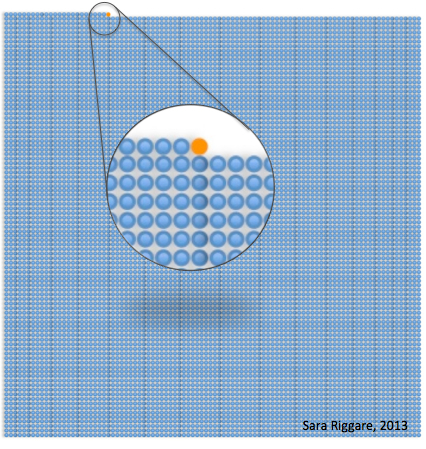 Inside the biomedical research community, by contrast, such ideas get a cooler reaction. 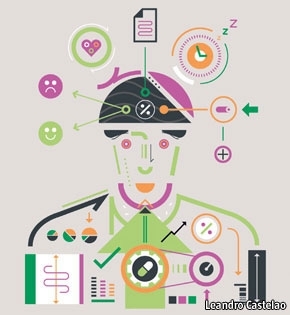 In the traditional medical model trained researchers do research, qualified clinicians practice medicine, and patients participate in clinical trials — they don’t study and manage their own healthcare. But clinicians and researchers might be wise to take notice. History shows that “disruptive” change tends to come from the outside. Just as the music industry didn’t invent Spotify, and the phone company didn’t invent Skype, so it’s unlikely that clinicians and biomedical researchers will be the ones to tear down their existing biomedical infrastructure and replace it with something different. Of course, those disruptive outsiders, whoever they are, can expect to face resistance. As the personalized genetics company 23 & me discovered, there are lines that entrepreneurs cannot yet cross without attracting FDA censure. 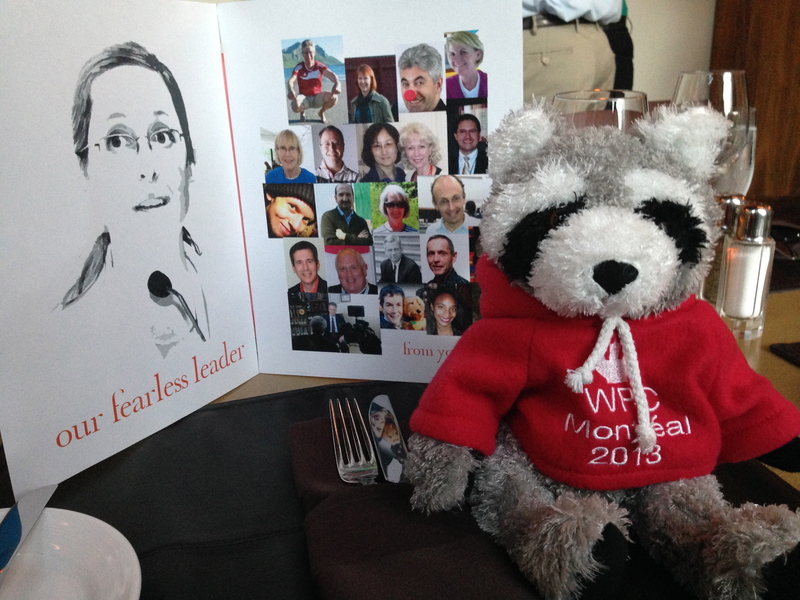 This is an article I wrote for “On The Move”, the magazine of Parkinson’s Movement on my experiences when travelling to the World Parkinson Congress in Montreal earlier this year. In the magazine, the article had to be slightly edited to fit the space available, but this is the “uncut” version 🙂 . 1. How many sets of medication should I bring? 2. Will I have to change my medication timings due to traveling over multiple time zones? 3. 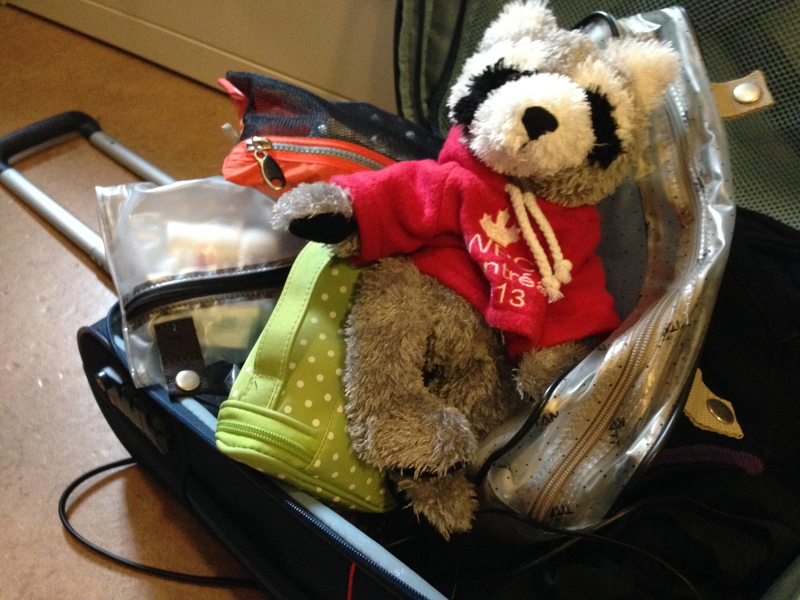 Do I pack an adorable cuddly raccoon in a red hoodie in my check-in luggage or in my carry-on? Traveling to Montreal took me on an unusual route: From Stockholm to London for a few days, then on to San Francisco for a few days and from there to Montreal and WPC 2013. 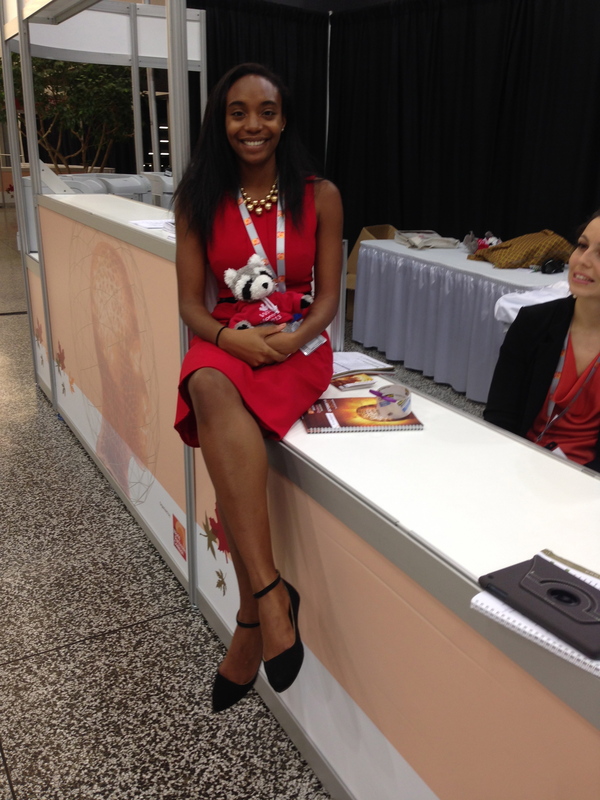 I was going to be “on the road” for 16 days, going over multiple time zones several times and attending 3 conferences. So that gives the answer to question number 2; yes, I would have to change my medication regimen, several times. After a lot of thinking, I decided on four complete sets of medication, to be on the safe side, and to pack one set in my suitcase, one set each in my two carry-ons and to give one set to my colleague. Question number 1 sorted. 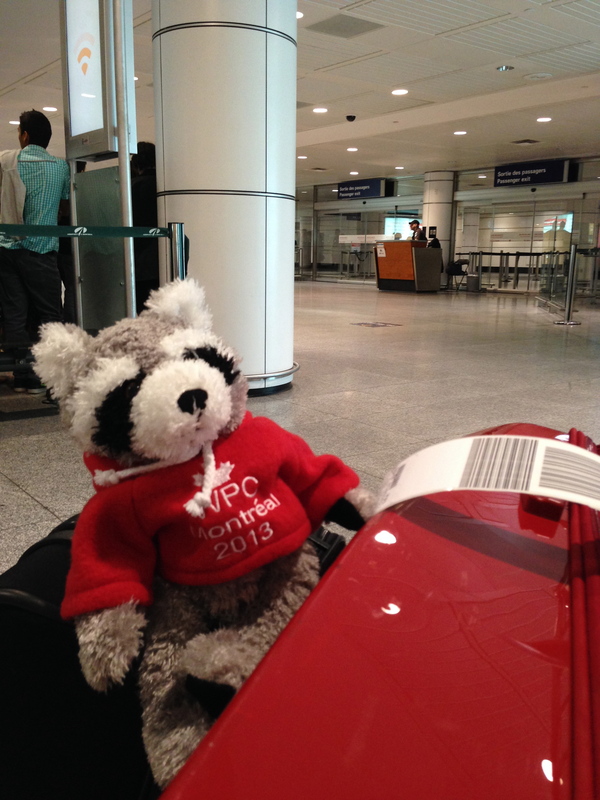 The racoon is of course the loveable mascot of the WPC, Parky, created by initiative of one of my fellow WPC 2013 ambassadors, Canadian Bob Kuhn, to give the people coming to the congress a chance to support the WPC and at the same time have something to bring back to children and grandchildren. 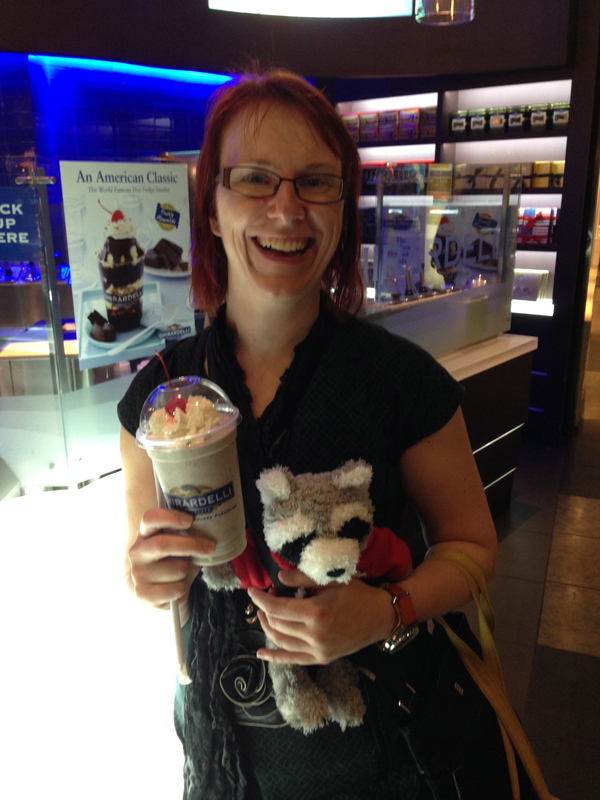 Parky proved to be an excellent travel companion. Not only did he help me pack my medications, he was also an excellent ice breaker and conversation starter, but more on that later. And of course, I couldn’t check him in! Question number 3: check! As you all probably know by now, I am an engineer by training and a few years ago, I decided to combine my engineering skills with my patient experiences and try to improve things for myself and others with chronic diseases. Pretty much exactly three years ago, in September 2010, I started studying at a master’s program in Health Informatics at Karolinska Institutet, a program combining technology with all aspects of healthcare. It was just what I was looking for! Just a month into the program, I went to Glasgow for the 2nd World Parkinson Congress, and came back with an even greater conviction that I could really make myself useful and contribute to the Parkinson community. In March 2012, I was registered as a PhD student at the department for Learning, Informatics, Management and Ethics at the Karolinska, and my research is focussed around how we can use observations we make about our individual disease to learn and even improve our own health. In my opinion, we can influence the effect our treatments (pharmacological and other treatments) have on us, both for better and for worse. I am not entirely sure of the situation in other parts of the world, but in Sweden, we have a lack of neurologists, and we don’t have that many Parkinson nurses either. This means that I see my neurologist once or twice a year, about 30 minutes every time. In other words, I spend in total one hour in neurological healthcare every year. The rest of the year’s 8 765 hours, I spend in selfcare. During all those hours, I can observe my condition and learn about my individual variations and patterns and this gets easier and less burdensome if I have useful tools, for example different apps and other devices. So, I figure that the information that I can collect during all those hours of selfcare every year, can be of use when I see my neurologist, as a way of giving both him and myself an idea of how I’ve been doing since last time and in my research I am exploring collecting and presenting information that is both relevant and useful, using apps and devices like sensors and other things. The methodology I am working on in my research, came in very handy when going on this multi-legged trip. I hadn’t travelled much across multiple time zones since starting medicating for Parkinson, so I was concerned about how to adjust my medication timings in the best way so that I would be able to get the most out of all the conferences as well as hopefully also have some energy left. I decided to try to make sure that I could start the next day on every new location with my morning dose on the ordinary time in local time. When travelling west, this meant adding a dose or two during the day of travelling and for travelling east, I took out one or two doses compared to my ordinary daily dose. I tried to keep to the usual intervals between doses to be able to function during the flights as well. The results were very good! I took notes during the travelling on when I took my meds and how I was feeling and I was very happy and a bit surprised that I was able to give my presentations at the conferences as planned and also have energy for some sightseeing. Travelling with Parky was, as I said earlier, an enjoyable experience; we had a milkshake together in downtown San Francisco in preparation for a presentation at a Quantified Self meetup (if you haven’t heard of the Quantified Self, google it, I think you’ll find it interesting) and saw the Golden Gate bridge together. 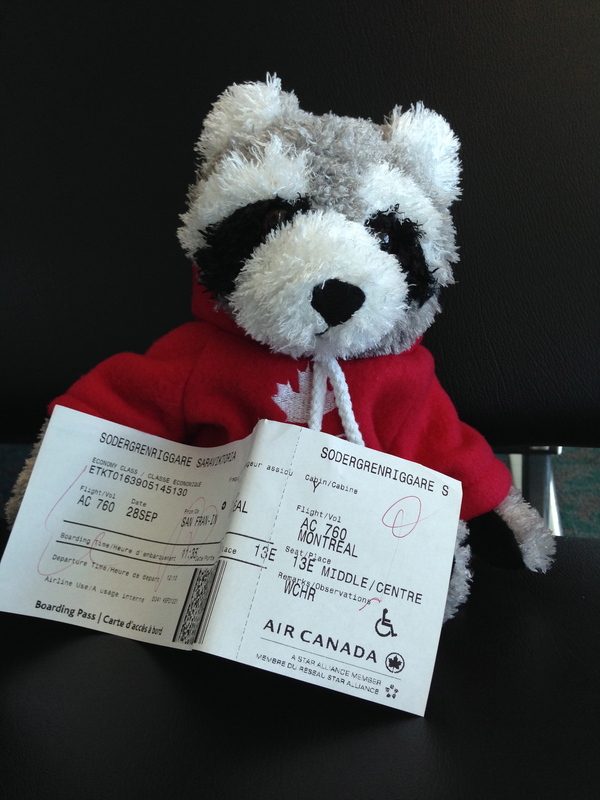 He also kept me company in all the airports and made sure my ticket was safe. In Montreal, he helped me meet new friends and basically was the center of attention. 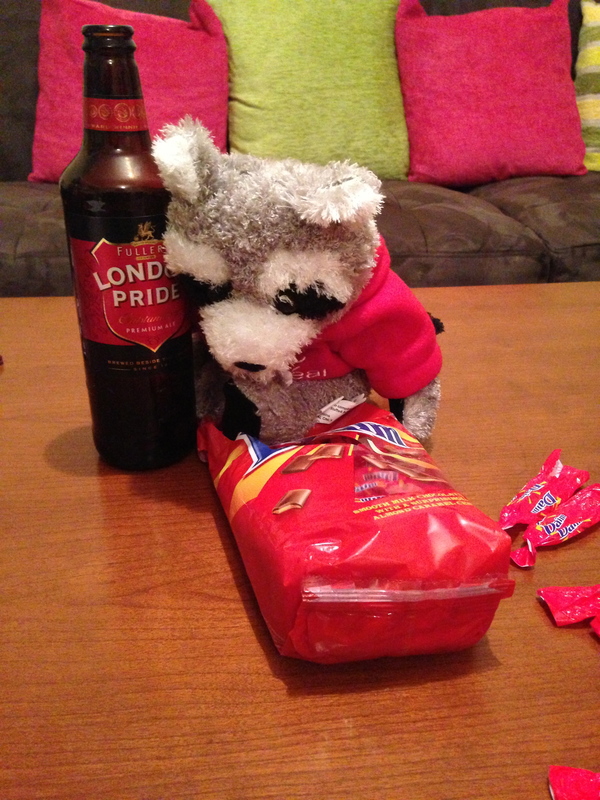 But in London, he was a bit out of line… I left him in the apartment we had rented when we were at the Medicine 2.0 conference and when we came back, he had drunk our beer and even eaten our chocolate! 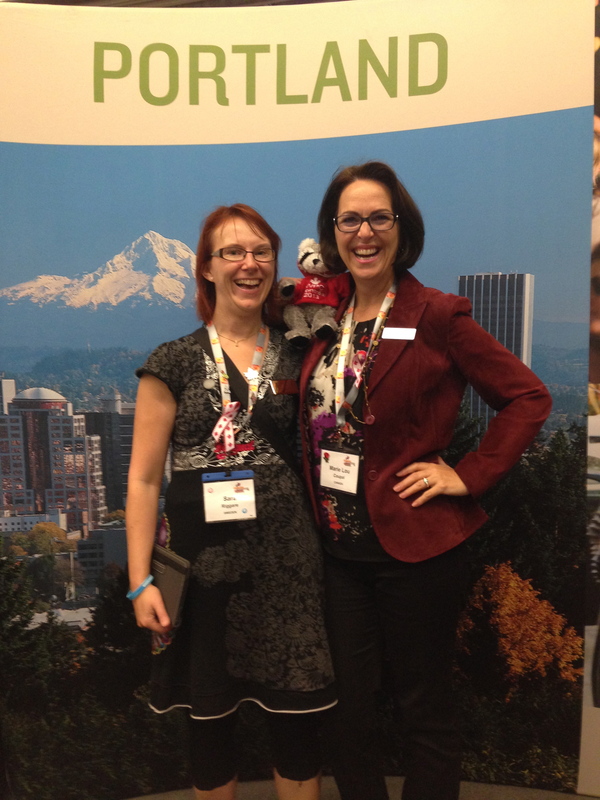 Safely back in Stockholm, we both are looking forward to going to Portland, Oregon in 2016 and meanwhile, Parky has also made some new friends. 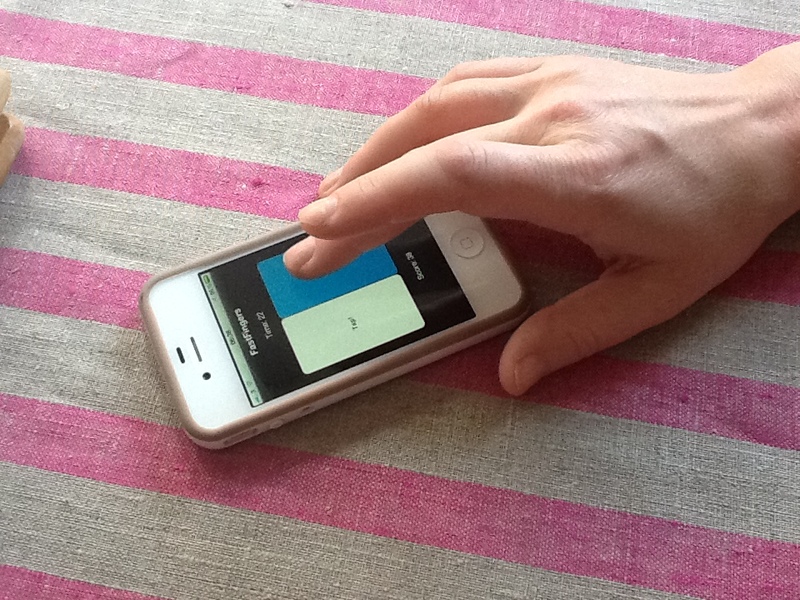 To evaluate the effects of my medications, I use an app on my iPhone. I don’t have the tremor that most people (including myself) associate with Parkinson’s, but instead I have bradykinesia (slowness of movement) and rigidity with a bit of balance and gait problems, just to make it more interesting. I did know that tapping tests are used to evaluate Parkinson’s clinically so I looked for a tapping test on my iPhone and found “FastFingers”. The app has a window divided in two halves and I think that you are supposed to alternate the tapping between the two halves, but I only use one side. I make sure that the lower part of my palm, thumb, ring finger and little finger are resting against the table, see photo, and tap with my middle finger as fast as I can for 30 seconds. I do this with my right and my left hand a number of times throughout the day and record the results (time and number of taps). 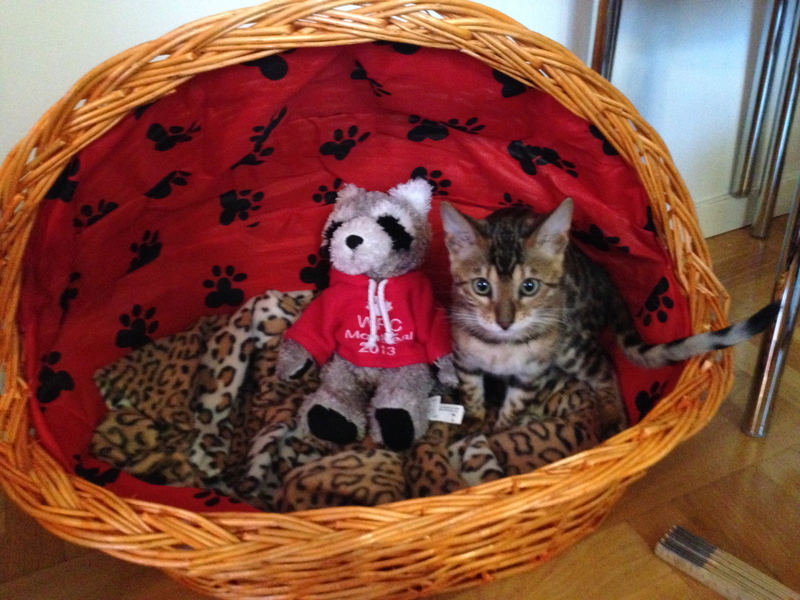 Thank you Zalamanda and Marten, for your comments on my previous post. Of course, I agree with both of you, two days is far too short a time to expect any kind of significant results. Nevertheless, I did observe some potentially interesting findings in these two days. 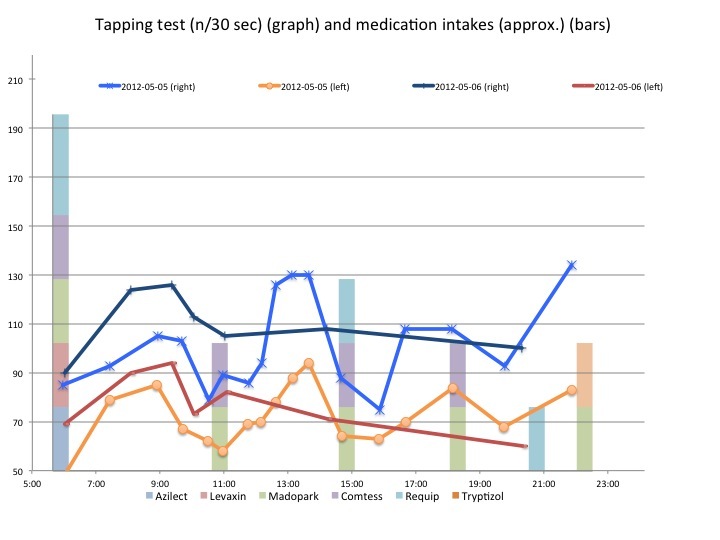 The first graph shows the measurements i did on my very first day on the new dose. And the small change I did was that I now take my second dose of the day, a “type A” medication (see a previous post here) at 11 am instead of 11:30 am and have also added a “type C” medication, that hopefully will make this dose last longer and if I’m lucky, the dose will have effect until dose number 3 at 3 pm so I don’t have to take that earlier. 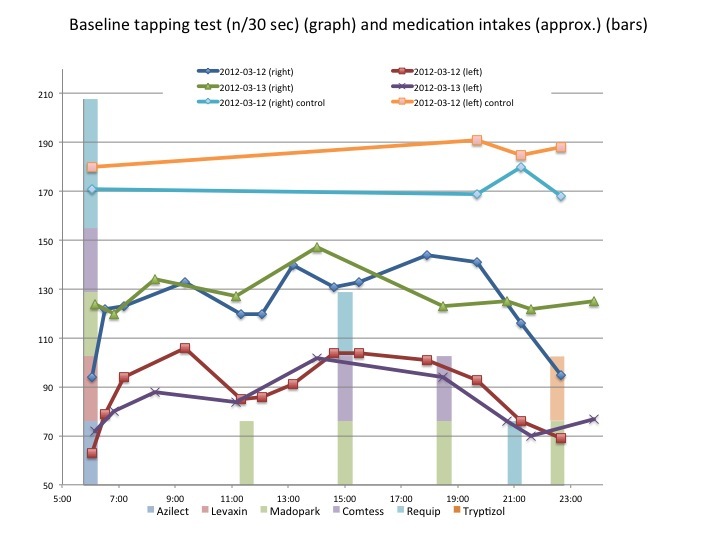 Interestingly enough, the measurements of the very first day on the new dose, indicates that the small shift in time for dose number 2 actually has an effect. Both my right and my left hand scores very high around 1 pm, pointing towards a distinct effect of the changed timing. At first glance, the results from the second day (second graph) is less optimistic, there is no sign of the peak around 1 pm. However, the observant reader will notice that there are no measurements recorded between approximately 11 am and 3 pm (shame on me…), meaning that the function in my fingers might very well have peaked during that time without me having recorded it. Mental note to self: Make sure to record frequently, especially between 11 am and 3 pm. I have compiled the measurements during these last two days, see below. Compared with my base line measurements, they look very random and I will attempt some sort of analysis tomorrow. 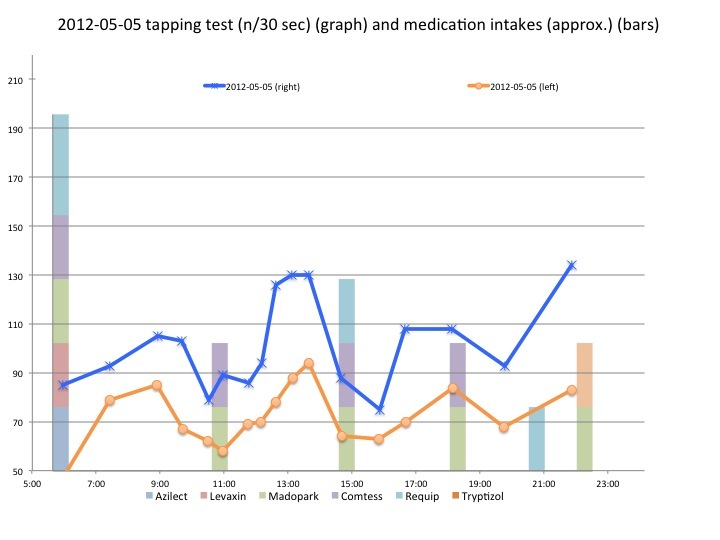 The first day on the tweaked dose went OK, no fantastic change, but I didn’t expect that either. Let me try explaining in some more detail, how the different Parkinson’s medication works. Remember the different types of Parkinson’s medication I mentioned yesterday? Let’s call the levo-dopa based medication type A. Further, let’s call the kind that imitates the effects of dopamine type B. You might remember that there are two kinds of Parkinson’s medication that inhibits the transformation of dopamine into other chemicals. One type has no effect by itself, but only when taken at the same time as type A, we can call this kind of medication type C. And let’s call the last kind type D. All these different drugs behave differently in the body, they have different uptake rates and biological half-lives (this is where my background in chemical engineering comes very handy). And this, as you might realise, results in an extremely complicated system of different chemical reactions, that in an ideal situation would give me an even concentration of the substances lacking in my brain. Unfortunately, there is no easy way of measuring the concentration of these substances, so instead I try measuring the effect of these substances, meaning that I try to find ways to evaluate my different symptoms objectively, but more about the measurements in a later post. As you can see, the regimen is in no way simple, but it has served me very well for the last few years. You might notice that my 11:30 dose consisted of only a type A and if you have been really paying attention, you might wonder why I don’t enhance the effect of the A with a C…. which is exactly what I have done. My “new” regimen is identical with the old one, save dose number 2 of the day. I now take it half an hour earlier and have added a type C. This might sound like a ridiculously small change, but I want to reduce the risk of getting unpleasant side effects. I use my iPhone, iPad and laptop to monitor the effect of the change. More about that later.